Scale, clean and rinse the salmon. 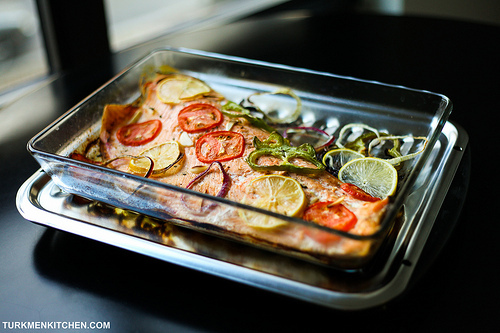 Place the salmon, skin side down, on a non-stick baking sheet or a glass baking dish that has been greased with the olive oil. Sprinkle with salt, red pepper flakes, dill and parsley. Press the slices of garlic into the salmon. Arrange the onion, bell pepper and tomato slices on top. 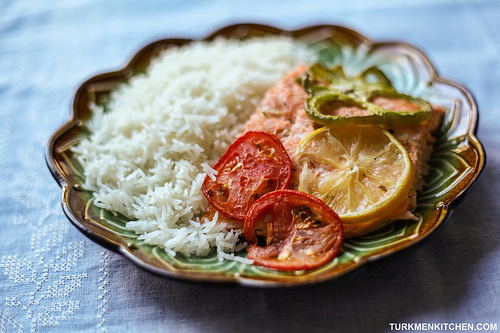 Squeeze one half of the lemon over the salmon, cut a couple of slices from the remaining half and place them on top. Bake at 250°C (482°F) on the middle rack of the oven for 20-25 minutes. Serve right away with Iraqi Turkmen Pilaf or Potato Salad with Fresh Herbs, if desired. Было бы здорово, если бы в Каракумском канале плавал лосось. Тогда бы это блюдо стало традиционно туркменским.